Hexacoil technology is a method whereby the wire used to produce the electromagnet powering a speaker, instead of using standard round wire, uses wire in form of a hexagon. This enables the manufacturer to avoid gaps in winding, effectively packing more wire and less air in the same volume, which in turn means more power can flow without risk of overheating, or God forbid, burning out the speaker. Dynaudio is quite right in pointing out that there is a difference between continuous (effectively European - DVV) and short term peak (American way of declaring power - DVV) handling - while a speaker will accept say 100W continuous power, one quarter of the time it could live with peaks of say 200W, and one tenth of the time, non-repetative, it could survive something like 400-600W. However, any speaker can ultimately be overloaded, overheated and burnt to its death, it's just a matter of how long it takes; Dynaudio cautions against using low power amps for producing high level sound pressures, as this will make the amp clip, and clipping is the fastest and most reliable way to damage any speaker, no matter what its cost and size. Yet this little speaker, measuring approximately 32x18x28 cm (app. 12.6x7.1x11 inches), weighing about 5 kilos or 11 lbs, and using one 5" mid/bass driver and one 1.1 inch dome tweeter, can handle prodigious amounts of power when driven hard; Dynaudio says peaks of over 200W will not harm it. It has a nominal impedance of 4 Ohms, and a nominal sensitivity of 88 dB/1W/1m. But for the power handling, nothing outstanding here. On the back side, you'll find just one set of binding posts, plastic cased, made by WBT, which will easily accept 5.5 mm speaker wire, such as my Van den Hul 352 Hybrid and look capable of passing on many, many happy Amperes. A good point, too many others fail here. But as you unpack them from the modest carton, you will be quick to notice that these are no ordinary, run-off-the-mill speakers. They are small by any standard you care to name, just above the miniature, yet they exhude quality in a very calm, easy manner. No fancy forms, but the cherry finish is one of the best I have ever seen in my life; edges are immaculate, not a spot of imperfection, even after I used a magnifying glass. Somebody in Dynaudio really knows his cabinets as few others do. These are reflex loaded speakers, and the reflex port is in the back. It looks solid enough, but I dislike ports on the back simply because they make speakers with them still more sensitive to placement, especially regarding the rear wall. And sure enough, in their rather skipmy user manual, Dynaudio say that ideally, speakers should be "1- 1.5 m away from the wall", and go on to say that if speakers are placed on shelves near walls, bass will be increased in output. To that end, you will find supplied two foam plugs, which may be used to control excess bass output if necessary. A thoughtful touch many will appreciate, I think, because in my experience, small speakers usually end up on shelves. One of the reasons is that if people had big rooms, they would have probably bought big speakers too, and the other is the rather steep price of proper stands, which are, in my view, silly devices anyway. Acoustically, they make a lot of sense, but that's about it - you have to pay good money for them, which makes your speakers considerably more expensive, in addition to which you will end up using the same amount of space for stands with speakers as you would for a proper floorstanding speaker. Anyway, I played a lot with those plugs, I got brand new products which needed working in for two weeks (with me, they work 8 AM - midnight, no coffee breaks), and this gave me plenty of time to experiment with speaker placement and those plugs. Well, they certainly do work, can produce some rather interesting results and are impossible to misuse, the worst that can happen is that you miss some bass lines, and all you have to do for remedy is to remove the plugs. Dynaudio suggests that if placed on shelves, spikes or an absorbent material be used to dampen unwanted resonance transfers; sound advice (pun intended). First i tried cut to size industrial foam and got good results, as expected. The next on the list were my SoundCare spikes, which have done me so much good service; since the Countours do not have predrilled holes for spikes, I used the same ones I use to suspend all my hardware except the amps. Once again, they just shone, the sound cleared up immediately, fully restored to its natural (well - factory) settings. But I disagree with Dynaudio about "1-1.5 m" away from walls in case of using stands, in fact I think 0.5 m from the back wall (and mine is bare, so it reflects quite well) could well produce some very interesting results. However, Dynaudio is right is stating that each and every room has its own sonic signature, and mine is no exception, it just happened to agree with this speaker. Well, by the time the Contours had been worked in, I had them safely placed about 0.5 m from any wall and such, acoustic plugs out in the box, and I really gave them a piece of my ear. Small speakers such as these at low levels always suffer from a definite lack of deep bass, and the Contours were no exception. It would be very unreasonable to expect a 5 inch driver to act as a 10" or a 12" one, so don't expect stunning bass lines at low levels. What you will receive is an ordered, well controlled, tight (in the positive meaning of the word) sound, in which nothing pushes and nothing pulls, just the deep bass notes lacking. This should not be taken as meaning these speakers are lean - they are not, but their approach is different. Rather than diddling the crossover for bass, the designers opted for another approach, to make it as linear as possible for the size, driver complement and price. Since the price is hardly small, being locally about 30% greater than I paid for my floorstaning JBL Ti600 (which is a 3-way speaker, using two 6.5 inch bass drivers, see test on TNT), I'd say their decision was a very sane one. More than that, I'd say that for once, you will get what you paid for, and with these speakers, linearity is the name of the game. What they have of bass is well balanced, clean and very well controlled, no boom, no flabby bass lines, no overhang, but not dry or sterile either, just reduced in quantity - and quantity alone. The midrange is also very clean and most coherent, with a well defined sound stage both left to right and front to back, something not at all easy to pull off. After settling down, or working in if you like, for some 150 hours or so, the treble will sort of focus, attain its final form. And it is a good one, sharply focused yet not shrill, with good incision when required, but never obtrusive in any way. These speakers truly can be pushed hard - but I would not recommend it. For a start, you don't need to push them very far for them to become loud, and then, when they do, they do so in very nice steps, more or less well following the amplifier's volume control, with good tracking (the speakers, not the control). When pushed hard, more bass will become evident at least subjectively, but the good news is that you loose out nowhere else, no trade-offs, just as you would expect for the generous price, yet not always delivered elsewhere (in my experience, hardly ever delivered). Essentially, you simply get more of the same quality of sound, hardly anything changes at all. Delivered with aplomb, I daresay. I also tried a rather cruel test, which is turning the volume knob on the HK 680 to about 12 o'clock and laying down some fast Hevia tracks ("La Linea Trazada", "Tanzilla", "El Salton"). I find music by Hevia generally heavenly, but in context of testing excellent for showing faults in speakers. This is rich music, many instruments playing all at once, most distributed right across the spectrum (from kick drum to patented electronic bagpipes and further up), and all that in very, very fast tunes. Many a speaker trips here, and starts discounting the sound, loosing this or that, sliding over something it should dwell on, or simply reducing the light it sheds across the shadows. Not so with the Contours, they remained exceptionally composed, chaging almost nothing, but simply playing louder, as required to do. I frankly admit I was impressed with this, I don't often have a chance to hear such control which keeps the speaker in balance, yet in no way intereferes with the program material. I have heard many much larger and more expensive speakers fail to do this as well as these little boxes did (but on the other hand, I have also heard a few less expensive speakers do that too - JBL Ti600, for instance). Yet even at high levels, and despite the clean character of what they do have, I was hounded by a lack of true, gut-shaking, liver-slamming, deep, authoritative, blood'n'guts bass. I know I cannot expect it from such modest speakers, but I still need it to be truly convinced. Especially after Scott Faller got me hooked on Blue Man Group, a CD with some awesome bass notes on it, with four drum section playing together - small bass output and the music is anaemic, hollow and very unconvincing, and vice versa. So I drove the Contours via my JBL Sub10, an active subwoofer with a built in 100W amplifier driving a 10" bass driver in an approximately 50 litre cabinet. Now, in my view, nobody on this planet does bass better than JBL, but then this model is not exactly their last word, there are better and newer models around, this one has been here for some three years. In return, it has been well worked in, believe me. And sure enough, I got what I craved, some deep, powerful, authoritative bass lines. After much experimenting, I got two settings which worked great for me. One was a cutoff at about 80 Hz and the Contours in their bass reflex mode, the other was at around 110 Hz and the Contours in their acoustic plug inside the vent mode. The first combination gave very impressive bass, power by the truckload, but however impressive, it was a little on the rough side. More to impress, less to be truthful. Nice, plenty of teenage boom-boom appeal, but not really meant for serious listening. 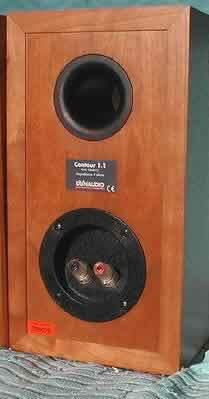 The second combination, sub at 110 Hz, Contours with plugs inside, gave a very satisfying ensamble. The Contours were at their best, their composure and control at their absolute, and the Sub10 supplied the power, energy and slam. Of course, it couldn't go as low as with a lower cut-off frequency, but it went low enough. However, in this setup, the overall sound was much smoother than in the first combination. It was not nearly as impressive on first listening, but after an hour or so, one realizes that one is dealing with balance here, not in-your-face effects. Male vocals were smooth, female vocals downright impressive. But what won me over was the overall balance, arrived at after some days of fiddling around with Sub10's volume control - just the right control, just the right warmth and just enough blood and mayhem when the going got rough. Then I went for total sacrilidge and attached a DVD player to the system; in my defence, in straight stereo mode (forgive me, father Lucio, I will sin no more!). DVD sound, in my view, has nothing to do with audio truth and linearity, it has everything to do with impressing the audience. Hollywood will do anything, that's ANYTHING, to make a movie more memorable, and sound effects are very high on the list. On the other hand, play "Matrix" which got an Oscar for sound effects (well deserved, in my view) at room sound levels and garden variety speakers start folding up, loosing it one way or another. Not so the Countours. They just keep playing, not caring one bit what you feed them, junk, jive or music - but watch that amp man, it could be dying on you! I stressed the HK680 there - not that it lacks power, it will kick about 300W into 4 Ohms in peaks, and that's serious power, people (and power to the people)! I don't know about others, but the Contours never said anything outside the program material. I half-expected them to show some stress, for God's sake, but they let me down there, no stress, just sound. And the HK680 was getting really warm, almost hot. My last bastion - turn on the "spatializer" on the DVD. This is a gadget which is supposed to insert some spatial clues regarding front and back into stereo sound; actually, it works rather well on my Marantz 4000. How well I learnt from the Contours, they outdid my AR94 there, audiably better, period. Be careful with these speakers. Do not expect them to impress you, except perhaps if you crank up the volume to unexpected highs and discover your amp is struggling, but not the speakers - and pay attention to Dynaudio's warning on not overstressing the speakers when brand new and before they have settled down, that's most reasonable advice. They will take about 150 hours to settle in, say 200 to be on the safe side. Instead, these speakers grow on you. Over time, you begin to appreciate them more and more, especially their outstanding linearity, even in my objectively difficult room. They are not a very easy load to drive, but at normal levels, you will be surprised at what comes out of them, in most senses. First, while they do not have deep bass, they do have a very decent bass range for their size, and that is one very clean, well controlled bass which is alive; not as appealing as JBL's, but very good by any standard. Second, that very decent bass has not been traded off anywhere anyhow, it has all the rest just as it should be. Third, "all the rest" is good, darn good, so good you won't be in any hurry to turn off the power, instead you'll want to do just a little more listening, and then still some more. Fourth, the soundstage from these speakers is essentially defined by the source and the electronics, not the speakers, and that is not at all easy to do; if it sounds flat, buy new electronics, leave the speakers alone, it's not their fault. But I strongly suggest you go for a subwoofer after you recover from purchasing these speakers, they sure can use one. It will add that oomph so necessary to give music its authority and weight, but to get the right balance, you will have to experiemnt a bit or a bit more. Logic dictates it should be a Dynaudio subwoofer, for the same overall "color" of sound, but it's your choice. Feel free to put them on shelves if you have a subwoofer, because then you could add SoundCare spikes (for electronics, not for speakers, 3 in a pack, exactly what you need, two on the front, one in the back) and get rid of boomy bass, realize the supreme balance these speakers offer and put in those foam plugs into the reflex vent. You'll get an earlier roll-off as in any acoustic suspension speaker, but with a gentler phase shift and the sub taking on the hard work. Your midrange will clear up a little more, and overall, you'll get truly impressive clarity. What I liked best about them is seeing how far the old AR statement about speakers was implemented - AR used to say in their literature that speakers good for rock or good for classical were in fact bad speakers, since a good speaker is good for everything and anything. 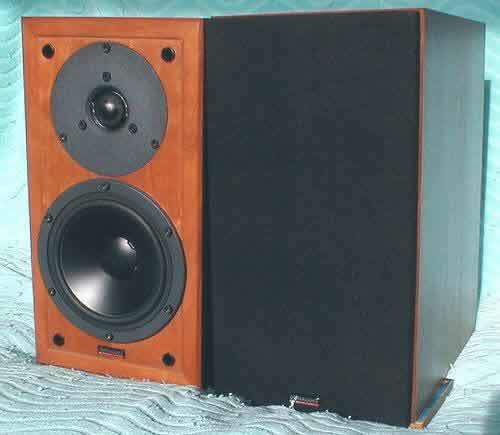 I remember that from 31 years back, and it seems Dynaudio works along exactly the same principle, at least judging by these Contours. These speakers really don't care what kind of music or sound in general you want, they just give it you, no buts, no ifs, no maybes. Their only possible miss - and I stress this is 100% subjective - is a lack of some joy of life, some exhuberance that JBL for example has. They are not cold or dead by any means, just not as much alive as I like my speakers to be. And the price, of course - I think of it as rather steep, even if I do realize quality build by its nature cannot be cheap. Then again, its price is highly relative to what one earns. Could I live with these speakers? You bet I could. Would I change anything in them? No, nothing, they are just right, but I would add an active subwoofer, I like a punch in the stomach when required by a kick drum or a tympani. Would I buy them? No, I simply don't have the money, but I just put them on my Santa Claus list. Have I heard better? Yes, once, but it's a prototype, so I'm not supposed to tell, and ultimately, that one will probably cost the same or 5% more. Well done, Dynaudio, you have much reason to be proud of Contour 1.1.